If You See Something Purple On The Sand This Summer, Run Away! Many of us enjoy going to the beach during the summer, and it can be nice to get away from it all. There is nothing quite like laying out in the sand and enjoying the warm temperatures, especially after a long winter. More than likely, you may even appreciate going for a walk along the beach, as it can be both relaxing and inspiring. There is a danger on the beach, however, and it is one that you should be aware of. It is a relative of the jellyfish known as a Portuguese man-of-war. They have been washing up on the shores of the eastern coastline and if you see them, you should stay away. Although the Portuguese man-of-war may sound like a rather exotic and interesting creature, it does pose a risk to your health and wellness. You will recognize them because they are a pretty blue or purple color with bubbles that are floating on the surface of the water. They also have long, dark purple tentacles that hang from them. Those tentacles are what make the Portuguese man-of-war so dangerous, because they are full of venom. These creatures should be avoided when you see them in the water or if they have been washed up on the beach, as they can still sting you. 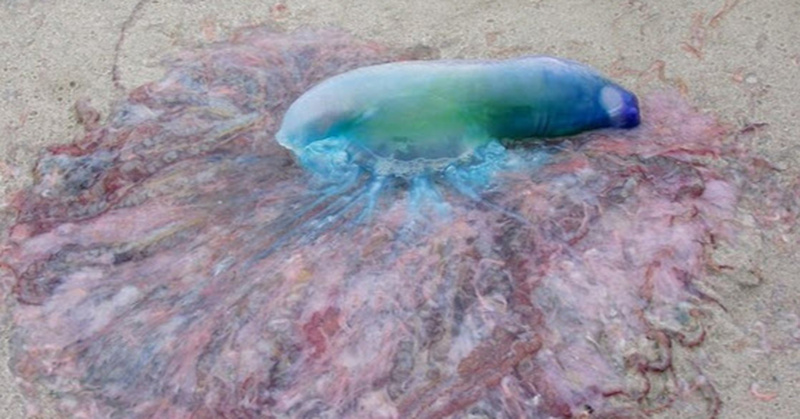 If you are stung by a Portuguese man-of-war, it can result in some fairly serious problems. Those problems may range from painful welts to cardiac distress or even anaphylactic shock, a potentially deadly problem. If you are stung by one, it is important to get medical treatment. Don’t fall for the old wives tale that you should pee on the area, it would make it worse. A cold compress can help to relieve the pain. 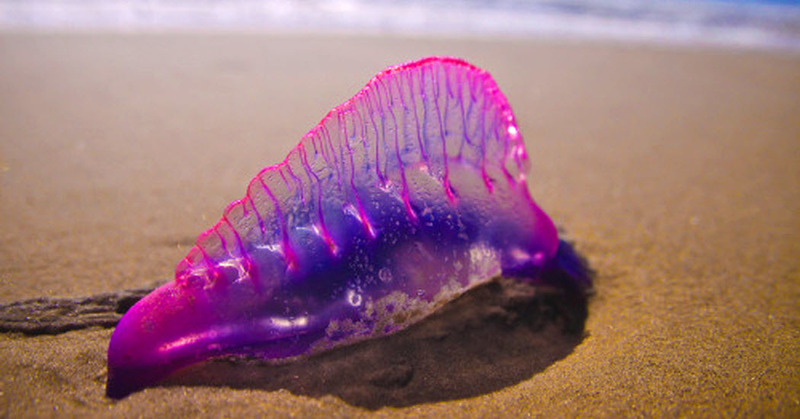 The Portuguese man-of-war was at one time known as a jellyfish but they are actually a siphonophore. Jellyfish are single, multicellular organisms but a siphonophore is a colonial organism. There are many different animals that are interconnected to work together but they can still survive independently of each other. That is why the tentacles are capable of stinging, even after they detach. You can learn more about the Portuguese man-of-war and what to do when you see one in the following news clip.